Have you ever noticed how some things just pair themselves up naturally? Like peanut butter and jelly, or maybe Batman and Robin? 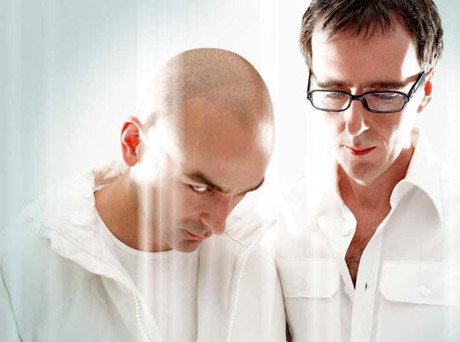 Another reoccurring relationship seems to be between film director Danny Boyle and UK dance act Underworld. The group lent their tripped-out rave number "Born Slippy" to Trainspotting, they collaborated with composer John Murphy to score Boyle's sci-fi flick "Sunshine" and now it looks as if they will be getting together again for the director's next project. The Playlist reports that Boyle has brought Underworld on board to score a stage revival of Mary Shelley's Frankenstein, which will be performed at the National Theatre of London. While we likely won't hear a lick of music before the play opens on February 5, we're keeping our fingers crossed that the dance duo will rework their Trainspotting hit into an electro goth-romp titled "Born Stitchy." Interestingly, the production also re-teams Boyle and Underworld with Johnny Lee Miller, who played Sick Boy in Trainspotting. Miller will alternate between playing Dr. Victor Frankenstein and his monster with actor Benedict Cumberbatch (Atonement). Frankenstein runs February 5 to April 17.